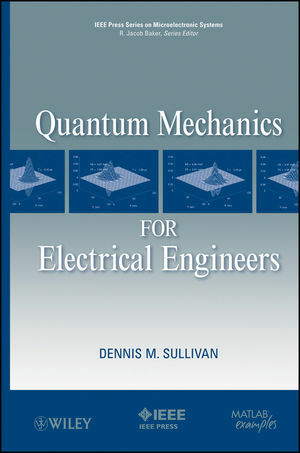 The main topic of this book is quantum mechanics, as the title indicates. It specifically targets those topics within quantum mechanics that are needed to understand modern semiconductor theory. It begins with the motivation for quantum mechanics and why classical physics fails when dealing with very small particles and small dimensions. Two key features make this book different from others on quantum mechanics, even those usually intended for engineers: First, after a brief introduction, much of the development is through Fourier theory, a topic that is at the heart of most electrical engineering theory. In this manner, the explanation of the quantum mechanics is rooted in the mathematics familiar to every electrical engineer. Secondly, beginning with the first chapter, simple computer programs in MATLAB are used to illustrate the principles. The programs can easily be copied and used by the reader to do the exercises at the end of the chapters or to just become more familiar with the material. DENNIS M. SULLIVAN is Professor of Electrical and Computer Engineering at the University of Idaho as well as an award-winning author and researcher. In 1997, Dr. Sullivan's paper "Z Transform Theory and FDTD Method" won the IEEE Antennas and Propagation Society's R. P. W. King Award for the Best Paper by a Young Investigator. He is the author of Electromagnetic Simulation Using the FDTD Method.